The region inside the circle is called its area. The formula to find the area is Area = π x r 2 ; where the value of π is taken as either 3.14 or 22 / 7. The unit of area is m 2 or cm 2 . 1)	Find the area of a circle of radius 4.2 cm. 2)	A copper wire, when bent in the form of a square, encloses an area of 484 cm 2 . If the same wire is bent in the form of a circle, find the area enclosed by it. 3)	PQRS is a diameter of a circle of radius 6 cm. The lengths PQ,QR and RS are equal. 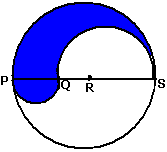 Semicircles are drawn on PQ and QS as diameters.Find the area of the shaded region. ∴ PQ =QR =RS = 1/3 x PS = 1/3 x 12 = 4 cm. ∴ Area of shaded region = Area of semicircle with PS as diameter + Area of semicircle with PQ as diameter – Area of semicircle with QS as diameter.